Was the Driftless Area Obama’s Ace in the Hole? HomeBusinessWas the Driftless Area Obama’s Ace in the Hole? At first glance you see that Romney won most of the land area, because he won the rural areas. But take a closer look. Now you see there are a few rural areas that he didn’t win; New England, the band of counties from North Carolina to Mississippi with large black populations, the Hispanic counties on the Tex-Mex border, the iron range of northern Minnesota, Native American counties out west, and some Colorado ski resort areas. But basically Romney won the rural areas. Except . . .
Do you see it now? There’s a big blob of counties where Wisconsin, Minnesota, Iowa and Illinois come together, which are solid blue. Why is that? These are counties with farms and small towns, there are basically no cities of any size. The biggest city is Madison, population 200,000, which is the big blue county in south central Wisconsin, on the eastern edge of the blob. I grew up in Madison, but I don’t have a clue as to why those counties further west are blue. I always assumed western Wisconsin was exactly like north-central and eastern Wisconsin—full of corn and dairy farms, and small towns with one church and 4 bars. Counties full of people with northern European backgrounds. Everywhere else in the Midwest the farm areas went for the GOP, except that strange blob that overlays parts of 4 states. A few of those counties may have small cities with a few manufacturing firms, but look how uniform that blue area is. There is obviously some difference that explains this, and now I feel like we should have been taught in school that southwestern Wisconsin is really weird. Whoa! That is exactly the same area as the strange blue blob of rural Obama voters. This is beginning to resemble a Stephen King novel, or H.P. Lovecraft. What’s going on in them thar hills? You might argue the blue extends a bit further south into Illinois, but that’s probably the Quad cities area, which is somewhat more industrialized. 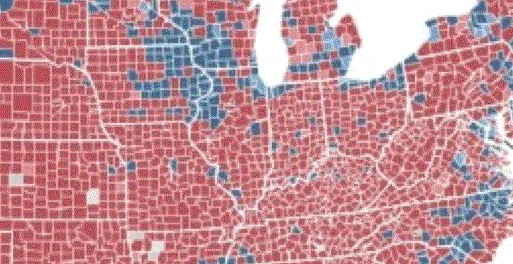 The mysterious blue farm counties almost perfectly match the Driftless Area. If these counties were red like “normal” rural counties are supposed to be, the race would have been closer. Indeed if the national vote had gone 3% more toward Romney, then those counties might have been the difference that kept Iowa and Wisconsin blue. I wish that had happened. Suppose Romney had won Ohio, Virginia and Florida, but still lost the election because he was one state short. And he would have come close in Iowa and Wisconsin, but not close enough. Obama would have been elected President because a bunch of white farmers in the Driftless Area voted for a liberal black Democrat, while just about all the other white farm counties in American were going for Romney. It was Obama’s ace in the hole had the election been closer. Why did farmers who settled hilly areas become more liberal than farmers who settled flat parts of eastern Wisconsin? I have no idea. The Appalachian and Ozark regions are far hillier than the Driftless Area, but are strongly red. It’s a mystery. Only God (or Nate Silver) knows the answer. Obama’s Speech Tomorrow – $300B More in Stimulus? 13 Comments on Was the Driftless Area Obama’s Ace in the Hole? There is no secret here, Scott. 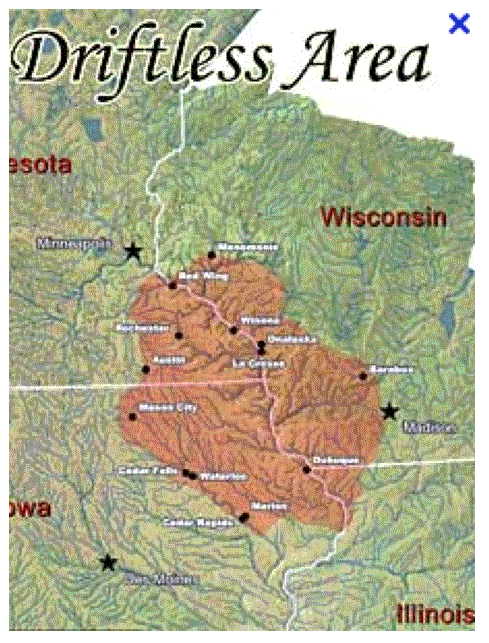 the Driftless region that baffles you so is the home to the largest concentration of organic farms in the US, and these farmers and the community that surrounds and supports them, are hardworking, open minded peaceful people. They value people above profit, they are neighborly and fair minded. They are not cut throat capitalists, that will sacrifice the environment or each other on the altar of immediate profit. They work cooperatively and see value in things that cannot be measured, even by modern political analysts and their models. They are motivated by a vision of the future that includes equality and social justice, a healthy and holistic goal that will enable their children and grand children to thrive. We are the future. Maybe it’s that it’s an area full of engaged voters and is home to a strong labor tradition, world-class medical facilities (Mayo Clinic is in Rochester), and well-educated professors? I mean, I grew up there, so it might be easy for me to poke holes in this, but let’s spend more than five minutes with Google or Wikipedia and actually looking at an area before concluding that everyone who lives there is a farmer, even in jest. Next time at least recognize that the white line that cuts the region roughly in half is one of the biggest rivers in the country and dominates life (which includes their job and what they do in their free time) for a lot of people who live along it. That seems like a much more plausible explanation to me than the one you’ve put forth, especially given a similarly peculiar blue patch in western Mississippi and eastern Arkansas. Shhhhh, now everyone will want to live here. To everyone who now wants to move here, BEWARE! The frac sand mining industry is fixin to haul away the beautiful sand hills of the Driftless Area to coax the deep gasses out of North Dakota, Texas and Pennsylvania, to be burned and leave tons of carbon in the sky. Paradise lost? or will the heroic farmers/doctors insist upon full compensation for the entire region, not just site landowners? If the mining companies are not allowed to ‘socialize the costs’ while ‘privatizing profits’ they may just give it up. More conservation, less fracking gas! I’m not full of political facts, but what I do know is that I grew up in Viroqua, WI. 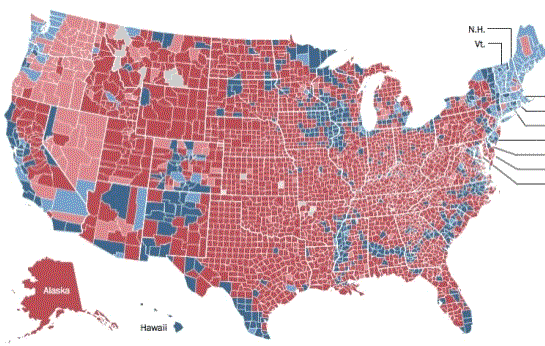 A small town of 4,000 people and according to your map, it’s in the BLUE color for Obama. I now live in another county in WI, but everyday I miss the hills and streams of Vernon County. It’s beautiful and a most serene place. Why the majority voted blue is beyond me (I voted RED) and something you may never know. In your words,”why they’re not “normal” like other rural counties”,is because in this country everyone is free to vote as they wish..no matter where they live. The purpose is to “not” be like each other, but to form our own opinion and follow through with a personal vote. They have no time to sit around wondering why someone voted red or blue…it’s a total waste of time. The people in this region have respect for each other and have too much hard work to fill their days. If they happen to be farmers it’s fantastic…they feed us and their job doesn’t end at 5pm. I have a suggestion…why not visit there and help the “farmers” milk their cows. They’re working hard to survive, but they may have a moment to confide in you concerning their vote. If not, I have another suggestion…make up a RED and BLUE map of Paris and go visit there! I think Kevin is right. All the Organic Co-op farmers is the first thing I thought of too, even though the one Organic farmer I know personally who lives in that area is a conservative, most of them probably aren’t. Just a hunch, but I would look for information on heavy proportion of Norwegian settlement. Seriously. As a resident of this region (Eau Claire), I believe a big reason is the ethnicity. There are a lot of Scandinavians (mainly Norwegians and some Swedes) that settled in these areas. A big reason has to do with the geography: the bluffs and hills are reminiscent of Norway (I’ve been to both, and the similarities are very apparent). The ideology these Scandinavian settlers brought has some roots in the Scandinavian socialist tradition, and it has evolved into a center-left approach to government in the Driftwood areas. None of the rural areas are solidly liberal, but they’ve trended blue in recent elections. A lot of these places used to be solidly Republican, but not conservative (similar to New England). Dale Schultz, the most moderate Republican in the Wisconsin state Senate, represents southwest Wisconsin, but — like places in Appalachia that traditionally elected Democrats but were conservative and are likely GOP in the future — his successor will likely be a Democrat. Anyone from Eastern Iowa shouldn’t see this as a surprise. Eastern Iowa is actually more urban than Western Iowa, with the Quad Cities, Dubuque, Mason CIty, Cedar Rapids, and especially Iowa City. More importantly, these are all college towns. Iowa City is often seen as the major liberal/progressive oasis of the state, and influence that continues to spread. The University of Iowa being a predominantly Arts school with an internationally renowned writing program doesn’t hurt. It also has a heavy student population coming from the Chicago area. Hawkeye sports brings in loads of tourism, allowing the ideas and comforts of college city living to rural visitors. I might predict Madison, WI has a similar influence for similar reasons, as well as the also commented-on prominence of organic farming. These areas are big on localization, growing increasingly weary of corporate farming, non-union industrial jobs and right to work laws. I grew up in northeast Iowa, right on the edge of the Driftless Area, and people I knew were not much beholden to party labels. In fact, they seemed to resent labels! Today I live in southeast Minnesota, and if anything, the people here seem to resent labels even more than Iowans did. For many years, Minnesota was considered to be a Democratic stronghold, but that began to change around 1990…after which we went 20 years without a Democratic governor. Both parties are fairly strong here, and know not to take anything for granted – which helps keep voter turnout high. In the past few cycles, though, the national Republican Party has shifted further to the right, and Minnesotans have been reluctant to follow suit. The First District extends all along the state’s border with Iowa, and the Republicans have not been able to take the seat from the Democrats, mainly because they have insisted on choosing right-wing conservatives, who are just not popular here – and certainly not in the Driftless Area!